Fall is in the air and with it comes the delicious harvest of winter squash, dark leafy greens, root vegetables and more that veggie lovers look forward to year after year. And it's not just vegetarians delighting in the bounty. Although vegetarianism, at least among the ever-influential millennial demographic, is estimated to be as high as 12%, a whopping 43% of 18- to 34-year olds report they often seek meatless meals when dining away from home. For a good portion of this demographic, those meals eaten away from home are frequently consumed in a college dining hall. "College foodservice operators as well as mainstream restaurateurs have figured out that serving a plate of grilled veggies or directing customers to a generic salad bar just isn't going to fly with today's customers," says industry expert Tara Fitzpatrick, senior food editor at Food Management magazine. "The reality is, students and their parents take the food choices into consideration when choosing a college. From there, it's up to college operators to tell their story and let students know about all the great plant-based options they have available in the dining halls," she continues. Hendrix College, a liberal arts college located outside of Little Rock, Arkansas, is one school that's leading the pack in serving up amazing plant-based fare that appeals to vegans and omnivores alike. 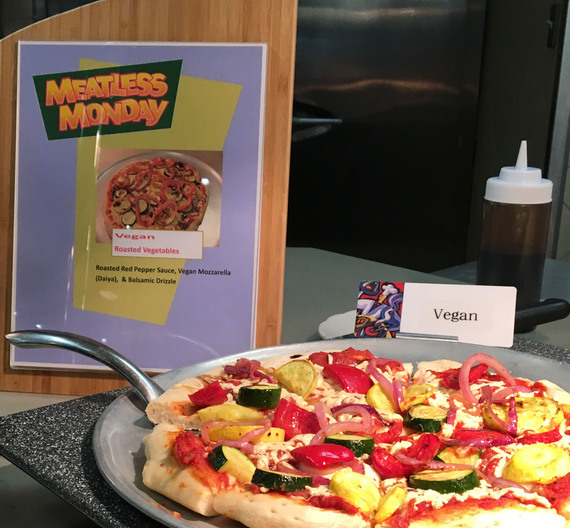 Since the start of the school year, the school has been using Meatless Monday, a non-profit public health marketing initiative in association with Johns Hopkins University, to market their unique vegetarian offerings. With it, they've seen resounding success. 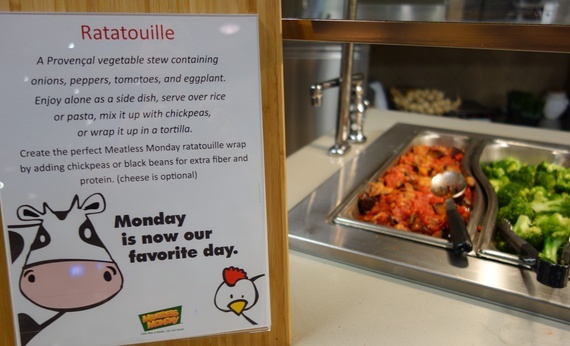 "I like the Meatless Monday approach of encouraging students to begin their week with a healthy start by eating more vegetables," says Cindy Mosley, MS, RD, LD, Hendrix's associate director of dining services. "I also know that our vegan and vegetarian options are eaten by non-vegetarians so I wanted to highlight those items to gain more student attention." The popularity of new items like vegan pizzas and a DIY wok bar have surprised even the dining staff. "Initially this promotion was to invite students to try more vegetables, but to see more non-vegetarians trying a variety of plant-based proteins with first skepticism, and now acceptance has been an added benefit," says Mosley. For college foodservice operations to be on the cutting edge of millennial dining trends, they need to recognize that although many of their diners may not be full-fledged vegetarians, they're still seeking plant-based options on a regular basis. "You could be a die-hard bacon fanatic who can also appreciate an amazing butternut squash and kale salad," says Fitzpatrick. "'Veggie centric cuisine has been getting more and more buzz lately and it is building up to have more of an inclusive vibe." That might explain the popularity of Hendrix's new vegan pizza offerings. "The response has been tremendous," Mosley says. "We've been getting creative with plant-based proteins and serving up unique pizzas like buffalo cauliflower pizza with a tofu bleu cheese dressing, southwest black bean with cilantro pesto and a Thai tofu with a chili curry sauce. They have attracted vegetarians and non-vegetarians." Considering millennials' higher-than-ever interest in this style of eating, campus dining may very well be the place for plant-based menu innovation. "Campus chefs are employing cooking methods to vegetables way beyond boring old steamed veggies: they are putting sweet potatoes in the smoker, charring root vegetables and using good local cheese for composed salads and bringing things like jackfruit into the picture," Fitzpatrick excitedly explains. But it's not just taste that's bringing more plants to campus plates. Eating less meat has significant health and environmental benefits, too. California Polytechnic State University in San Louis Obispo, California, is another institution of higher education that's offering more vegetarian options and using Meatless Monday to promote them, not only because students are asking for such fare, but because it helps the school meet their health and sustainability goals. "[Meatless Monday] encourages students to focus on plant-based options, educating students on the health, sustainability and environmental factors associated with eating less meat," says Megan Coats, RD, the registered dietitian and sustainability coordinator for campus dining at Cal Poly. "My role as Cal Poly's registered dietitian is to expose students to a variety of foods that support a healthful diet, including some they have never thought about or tried before," she continues. Coats plans to tempt her diners with restaurant-quality dishes such as rainbow chard ragu and gnocchi with ricotta cheese and fall mushrooms when Cal Poly's Meatless Monday promotion launches later this month. Neither Hendrix nor Cal Poly will be removing meat from their Monday menu offerings, though. The most successful Meatless Monday promotions spotlight amazing vegetarian dishes but keep meat on the menu, leaving the choice to participate up to the individual student. But the reality is, more and more students are choosing to participate. "This generation is more aware than anyone about the impact our food choices have," Fitzpatrick says. "And campus chefs are more aware of the alternatives to meat and dairy that they can use in an on-trend way that students will respond to." And the results are delicious. For more information on setting up a Meatless Monday program on campus, check out Meatless Monday Goes to College and contact the Meatless Monday team.